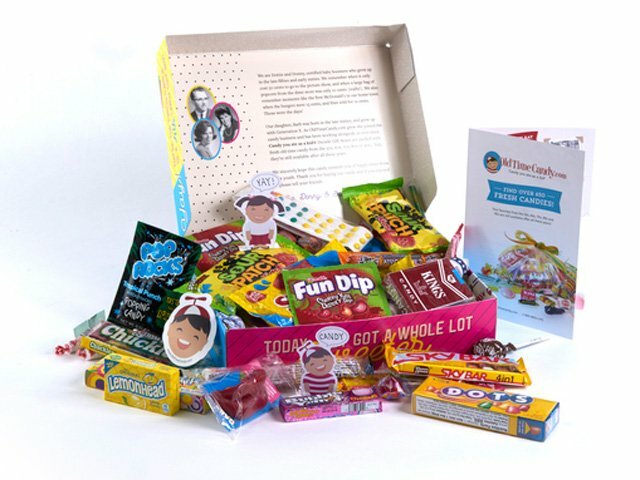 Candy Gift Boxes with a Predesigned Birthday Message: Select a Decade or Retro Candy Gift Box with a special Birthday message on the box top. Decade Candy Gift Boxes are available from the 1950s, 60s, 70s, 80s, 90s or All Decades. The 4 lb decade box is jammed with over 70 of your old time favorites, 60 different candies with some duplicates. The 2 lb box has over 40 pieces of candy, 35 different candies with some duplicates. Retro Candy Gift Box has more than 30 types of the smaller retro candies with some duplicates for a total of over 50 pieces of candy in a 1 lb box. Hand-Written Gift Cards: Yes, written by actual people and best of all, they're FREE. Available during checkout. Shipping: Orders placed by midnight usually ship on the next business day. Delayed shipping is available for arrival at a later date. FREE SHIPPING: All orders over $250 and shipping to a single address qualify for free UPS ground shipping. Continental US only; not combinable with other discounts.